The Common Core standards are still alive and well in North Carolina and next round of lipstick on the pig is already underway. Last year, North Carolina’s Department of Public Instruction (DPI) ‘revised‘ the high school math, also known as integrated math. The results of those revisions were mainly cosmetic and kept the bulk of the highly criticized integrated math in place. Now DPI is taking aim at grade K-8. 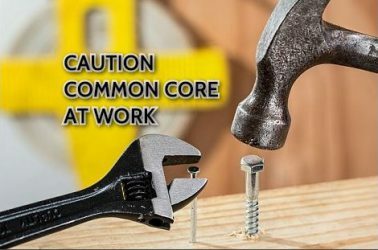 Without question, the most egregious problems with Common Core are found in the K-5 portion of the standards in both math and English Language Arts. Over the last five years, parents and teachers alike have spoken out about the age and developmentally inappropriateness of the K-5 standards. In North Carolina, those concerns fell on the deaf ears of the state superintendent Atkinson and were summarily dismissed. However, with Mark Johnson replacing June Atkinson, maybe parents can really be heard this time around. I say maybe because DPI is already full speed ahead on their revision process. In a newsletter dated January 30, 2017, DPI announced that revisions to K-8 mathematics standards and also “fourth math” in high school were already underway. The newsletter pointed to an online survey that would be used to garner input on changes to the current Common Core standards for K-12 English Language Arts. The survey has already closed. Setting standards: what North Carolina students should know and be able to do is a key element of the State Board of Education’s work in ensuring that students receive what they need in the classroom. Local educators use the state-adopted standards to create a curriculum to help their students meet each standard. Curriculum materials – textbooks, digital content, activities and lessons – are locally developed or selected. In January, the State Board heard updates on standards revisions for mathematics and English language arts, a process that occurs approximately every five years. This article first appeared at American Lens News in February 2017. This entry was posted in Am Lens, Common Core, EDUCATION, June Atkinson, NC Board Of Education, NC DPI and tagged Common Core, NC Board Of Education, NCDPI. Bookmark the permalink.